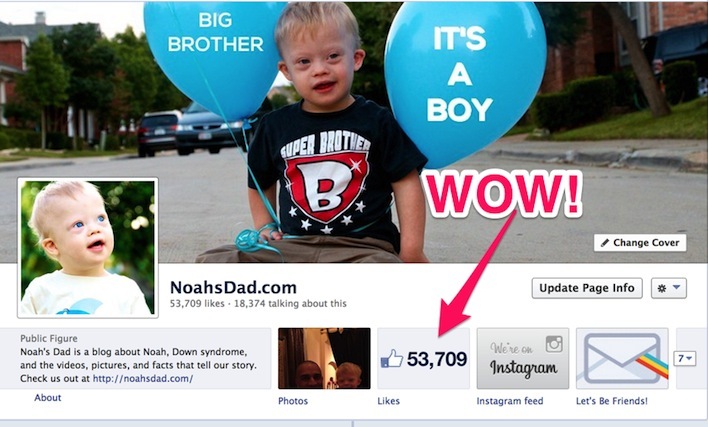 You are here: Home / Resources / 7 Epically Awesome Statistics About How Noah’s Facebook Page Is Changing The World! It’s hard to believe that our official Facebook page passed the 50,000 mark last month! I can still remember the day I started this page (and our blog) back in May of 2011 (which means we’re only a little more than two years old!) and trying to get just twenty five of my friends to “like” Noah’s page so we could get a custom URL! Thanks to my mom, brothers, wife, and friends for making that happen! It’s hard to believe we’ve only been telling our boy’s story for only a little over two years. It goes without saying that I never expected this thing to take off like it has. Our family has made countless friendships literally all over the world through this blog and our Facebook page. 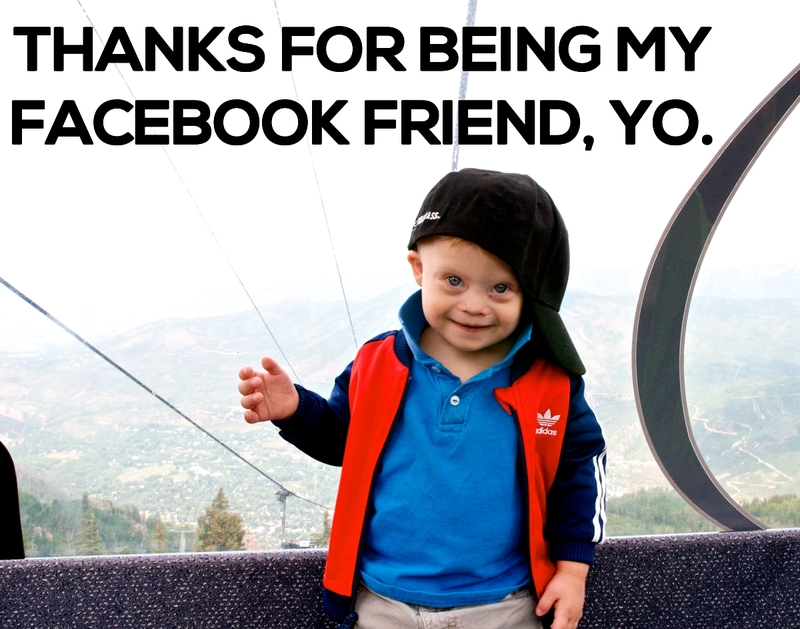 In addition to the friends we’ve made, we also receive messages on an almost daily basis about how this blog and Facebook page has been a source of encouragement and hope for parents who have received a Down syndrome diagnosis…which is awesome since creating Down syndrome awareness is one of the main reasons I started doing all of this in the first place! Since 50 thousand Facebook fans is a pretty awesome milestone I thought it would be fun to share a few statistics with you about who is part of this amazing community! I think you’ll see that we (our collective group of Facebook fans) are really making an impact around the globe, and truly showing the world that Down syndrome is ok! 1. Our Facebook Page Is Reaching An Average Of Over A Million People Per Month! Without a doubt the most amazing about our Facebook community (and the entirety of our social media proprieties including this blog) is just how massive of an audience / community we have created. Our little boy has developed a very large platform, and it’s not something we take lightly. The following screen shot is from just one week of Facebook activity. 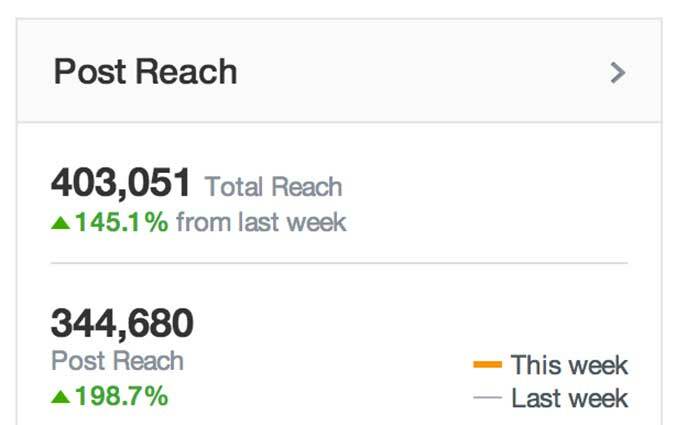 You can see the total reach of our Facebook page is over 400 thousand a week, which easily puts the reach of the just the Facebook page to over a million and a half people a month! When you add to that the number of people who connect with us on this blog, our twitter, Google Plus, Pinterest, Instagram, YouTube channel and email list, the numbers are staggering! As you’ll see below, not only are we reaching lots of people, we’re reaching lots of people across the globe! Over 400,000 total reach in one week! Thank you for being a part of this journey with us. It’s amazing to see how God is using our little boy to bring hope and encouragement to so many people all across the world. What a privilege and honor it is to be a part of this! By the way, if you haven’t signed up to get our newest posts by email, be sure to enter your email below so we can stay connected! 2. Next To The United Stated More People Visit Our Facebook Page From Pakistan Than Any Other Country In The World! It’s amazing to see all of the countries that people who visit our Facebook page are from. At the time of this writing we have 53,709 Facebook fan, and of those 25,744 are from the United States, 5, 463 are from Pakistan, followed by 3,519 from the United Kingdom, and 3,286 from Egypt. It’s really amazing to think about the kind of world wide impact our little 2 year old is making. I would have never imagined when Noah was born that he would be making an impact literally around the globe! For those of you interested, below you will find the top 45 countries along with how many “fans” of our page are from that country. Pretty cool, huh? It’s awesome to know there are people living with Down syndrome are over the world! By the way, I want to give a special shout out to the 31 people who visit our Facebook page from Uruguay! I admit, I had no idea where Uruguay was located, but now I do! What up friends from Uruguay!? 3. More People Visit Our Facebook Page From Karachi, Pakistan Than Any Other City In The World! I found this statistic very interesting: when you look at the individual cities where people are Facebook fans are from, Karachi, Pakistan ranks number 1! At the time of this writing we have 1,1779 fans in Karachi compared to the 530 fans we have here in Dallas (where we actually live!) In other words, more people visit our Facebook page from Karachi, Pakistan than that are from Dallas, TX…that’s awesome!!! In fact, Dallas is number 5 on the list, with Cairo, Egypt taking the number two spot! Once again, there are people with Down syndrome living all over the world! If you’re curious here’s a list of the top cities where are “fans” are located. Do your see your city on here? Are you as surprised as I am at any of the cities you see on the list? 4. 80% Of Our Visitors Are Female. This one wasn’t surprising to me. I know that mom’s tend to be more “into” stuff like this. Heck, let’s be honest…my blog is really a mommy blog by a dad. It’s all good. So any way, shout out to all the ladies out there! Again, not a huge surprise here either. Check out the chart to see more details about the age and gender of our Facebook friends! Most of our Facebook fans seem to be online on Friday afternoons, but surprisingly almost an equal number of our fans are online all seven days of the week. And even though our largest group of fans are online during the 3 o’clock hour, it’s actually pretty steady from about nine in the morning until about four in the afternoon. Since about 80% of our Facebook fans are women, almost half of those women are between the ages of 25-44, and the majority of our visits occur between 9 am – 4 pm, my assumption is there are a good number of stay at home moms checking out our Facebook Page while their kids are at school. I could be totally wrong, but it seems to support the data. Another interesting statistic is that there are over 6,5000 fans checking out our Facebook page 24 hours a day….even in the wee hours of the morning. Crazy, huh? Our entire family can’t say thank you enough for all of your encouragement these last few years. It’s truly been our pleasure to get to know so many of you (some of whom we’ve even got to meet in real life.) We’re looking forward to continuing to share our story with your and learning more about yours, both on our Facebook page, and this blog! 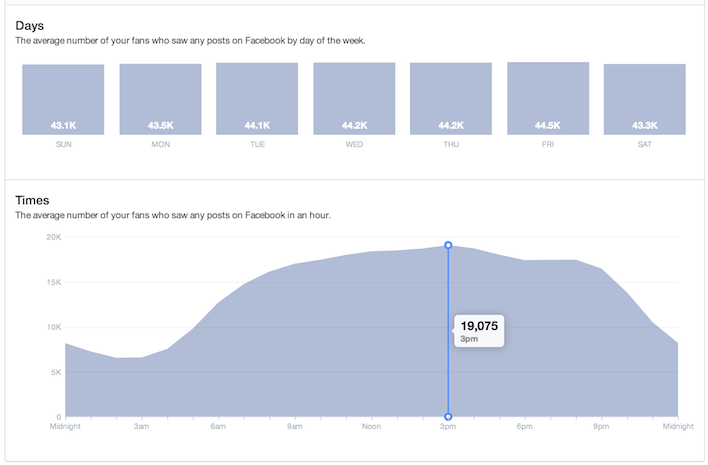 Which of these Facebook statistics stood out the most to you? How long have you been following us on Facebook, and do you remember how many fans our page had when you first “liked” it? Leave a comment below and let us know…also be sure to let us know where in the world you’re from and how our Facebook page has encouraged you. Thanks so much! Here’s to meeting another 50 thousand friends! I am in Botswana. Africa. I am a mother to a baby gal with Downs Syndrome. She is 2 yrs 10 months. She is turning 3 on November 23… Your FB page just motivates me daily. Thank you..
Wow, it’s awesome that you’re from Africa. Thanks for taking the time to say hello. Wow, are you serious?? If so, that is amazing! I live in Texas also, what part are you from? Also what brought you get from Uruguay to Texas?? Wow, that’s awesome! Did you know we are from the DFW area also?? In fact, there is a big fund raising for Down Syndrome in Ft. Worth at the Stockyards today!! If you don’t mind me asking, what does your husband do that brought you guys here from where you guys were? How do you like it? In what ways is it different than where you are from? And that’s funny about how most of those 31 people are friends and family of yours!! I have friends who have adult children with Down Syndrome. I knew both the kids when they were babies. One I babysat for. They are both wonderful adults who love the Lord, live independently and have wonderful fulfilling lives! That’s great! Stories like that greatly encourage me, so thank you for sharing!!! Yes I know! It would be great to meet you some day! My husband works in travel industry, for a company that has a branch in Montevideo, which is the capital of Uruguay, we both worked there, and he was relocated to DFW a year ago, just before our daughter were born. Of course there are differences between both cities, I miss the beach and the public transportation but I like it here also because is very quiet and people are really nice. Not sure if all those 31 are relatives or friends but I usually share your posts in FB or I send links to families in Uruguay who have children with Down Syndrome. That’s awesome! Are there are a lot of kids with Down syndrome where you are from? 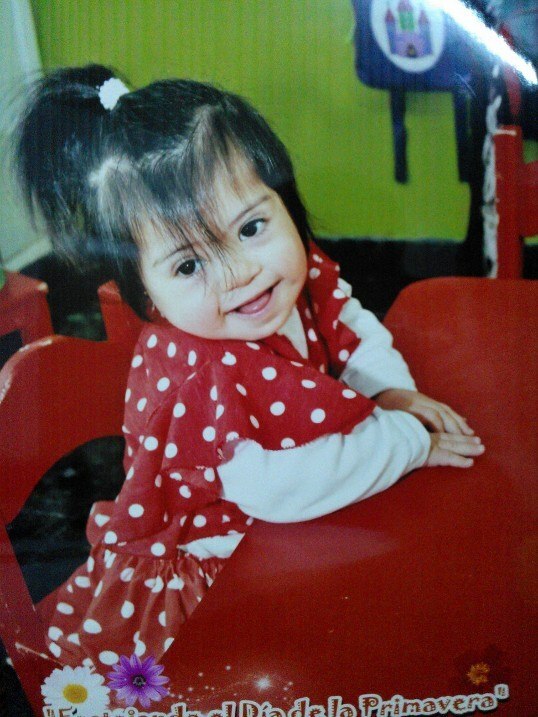 What’s it like rising a child with Down syndrome in your country? Maybe you guys could write a guest post for us! Actually, Agostina was born here in Texas, but when she was born I contacted a couple of moms in Uruguay since I didn’t know nobody here, so I know more or less how is living with a child with DS there. They’re beginning the inclusion at private schools, but the school may or may not accept them. Kids are supposed to attend the same classes as their peers, which is wonderful. They can also attend the class with an adult that will help them, if necessary. Those things are great, but only if you have the money to afford them. I always think what happens with those families that don’t have money for therapies (they’re not for free) and a private school. So, from one hand, at least at a private level, things are improving… from the other hand, I think that government has to do more for them, since the money that they give per month (if families qualify for it) does not cover therapies’ costs. i just love following noah and look forward to your posts, i live in cardiff, wales, u.k. and absolutely adore your son even though i’ve never met him. Thanks for the comment Susan! How long have you been following our story? Oh my god! I’m from Cardiff too! I just had to comment back when I read that! What part are you from? I’m not sure how long I’ve been following Noah’s page, maybe a year or two. For me it’s all about raising awareness, as I’m against abortion, which unfortunately is chosen by far too many parents when their child is diagnosed with a (possible) disability. As for the statistics, I’m probably most surprised that so many visitors are from Pakistan! Hey thanks Dolce! We’re glad you are on the adventure with us! Where are you guys from if you don’t mind me asking? My 11 year old son has DS, he will be 12 tomorrow. I enjoy reading where Noah is at with his development and reaching milestones. It brings back many happy memories. My Joey is adored by everyone who knows him. He is an expert on The Beatles and knows the lyrics to every song, who sings that song and the order of every song on every album (Oops showing my age there). It is amazing to witness. I remember “meeting” Noah when a friend posted a link to the Target catalogue and I found NoahsDad. He belongs to all of us thanks to you! My daughter is quite certain that she saw you all at Walmart but wasn’t sure. We live in Irving, TX and moved here from New Orleans due to Hurricane Katrina. I work with the IDD population and it’s super rewarding! Thanks for your comment, I bet your daughter did see us there! 🙂 Do you know when it was? Did I have Noah with me? You guys should have said hello? In fact we live close to that Wal-Mart – we have get togethers at our house all the time, you guys should come over! In fact, a funny story is one time someone reached out to me on Facebook and the ended up living on my street! Isn’t that crazy! I’m sorry to here about your little girl, that really breaks my heart. You sound like a great mommy! I’m glad you are along for the ride with us! By the way, feel free to post a picture if your family if you’d like! Also if you have a picture of Ashleigh I know everyone would love to see that as well! I found your page by “mistake” and I love to follow you and see all the lovely pics you keep posting! Noah is really such a sweet and cute guy – love him <3. P.S. I did not find Austria/Europe on your fan-list so I might be the only follower from there. Anyway I do wish you and your family all the best for the future!!!! Thanks for saying hello, and for the kind words! So what was the “mistake” that brought you to our website? I always enjoy learning about how people found our site. Also that is interesting that Europe make the list of all. 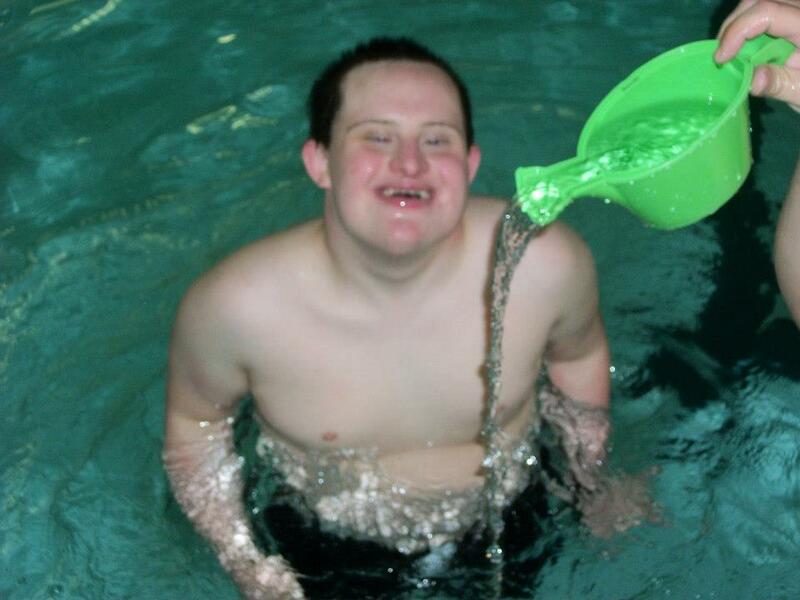 Do you know if there is a large Down syndrome population there in Europe? Do you have a child with Down syndrome / Special needs? Your blog is wonderful. I have worked with adults with cognitive disorders for over 15 years, many of whom have Down Syndrome. Many of my guys have jobs, some have apartments, and all have bright futures like anyone else their age. 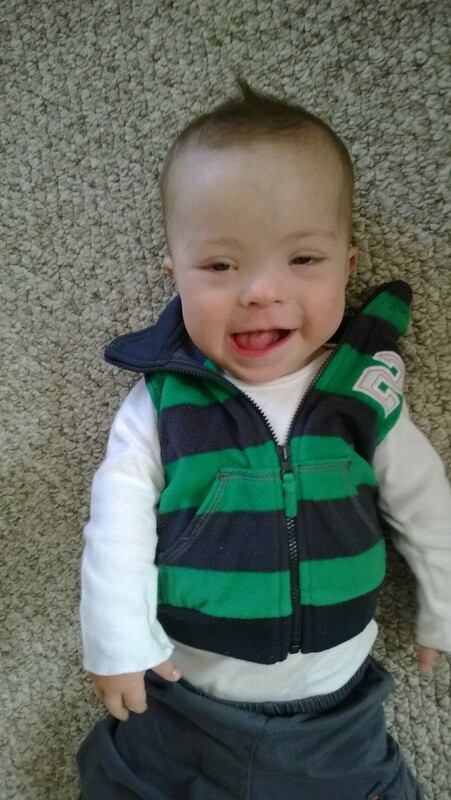 Your blog helps people see that the only difference in Noah is an extra chromosome. That extra chromosome may cause milestone delays and some health issues, but it doesn’t stop a little kid from being a little kid. It doesn’t stop hopes and dreams. You can say that again Lynne! So what sort of things do you do with your job? It sounds awesome. Hey thanks Gill! Lots of friends in the UK, love it! Good Morning!! I hope you are having a wonderful and blessed weekend so far! I love this time of year, autumn!! 🙂 I love being a fan of you fb page and reading your blogs. I have been a fan of your page a little under a year now. I am a nanny and one of the children Down Syndrome, he is 6 and he loves sitting in my lap as we read through your pages and look at the pics of your little one. Oh and i must say, Thanks, you have now got him hooked on waffles…lol..Keep up the great work and spreading the word you and your family are AWESOME!!! LOL, that’s awesome! Be careful with those waffles, they are addicting! How old is the little guy you nanny for, and where in the world are you guys from? You sound like a great nanny, I think it’s great that you are taking the time to learn more about Down syndrome and get to know other families! Way to go! I feel like a trend setter now. I live in a city that didn’t even make the list, Akron OH. Kind of like knowing about Batdad on Vine before he was on the Today Show. The best part is, I’ve gotten to watch Noah grow up in real time, while your site noobs have to catch up 🙂 I feel like he is our little friend. My kids (12 & 9) even asked if we can visit you when we go to TX to meet my new Nephew this spring. I told them that might be a little creepy and weird since we don’t really know one another, but if we saw you all while we were out and about we’d definitely introduce ourselves. That’s cool that you guys are following along. Do you have a child with Down syndrome? I’m from Alabama. I can’t remember exactly how I found your page or when, but it’s been a while. I have two sons, one is non-verbal/autistic. I totally fit the sahm/age bracket of your readers. I love seeing the pictures of Noah’s sweet smiling face. Even though our story is different, I enjoy the positive encouragement y’all provide. Thanks so much for sharing you life! God Bless! Thanks Jessica! How old are your boys if you don’t mind me asking? Hi, I am reading your blog from Colorado Springs, CO. I have a son with DS who will be one year this month. I am so glad I found your blog and have found so much inspiration in the short time I’ve been reading it. Thank you!!!! You’re son is adorable! Thanks so much for sharing his picture with us! Also we meet another family with a child with Down syndrome who live in Colorado Springs at the hotel we were staying at…the dad was actually a local pediatrician there. I wonder if you guys know each other! My best friend’s son was born with Down Syndrome in August 2011. He is a twin. Your page has not only educated me but has also warmed my heart. I’ve been following your story for about 2 years now and I love Noah & hearing about his accomplishments. I’m from Sudbury, Ontario, Canada! Hello from the Great North 🙂 Please keep your blog forever! You sound like a great “best friend!” Way to go for taking the time to learn more about Down syndrome! I am a 55 year old female with a friend who has a child with Down Syndrome. I love following Noah’s story, he is just the cutest and is such a lucky little boy to have you for his parents. I am from Nova Scotia, Canada please keep this blog going to educate the world!!! That’s awesome! You sound like a great friend as well for taking the time to read up and learn more about Down syndrome. 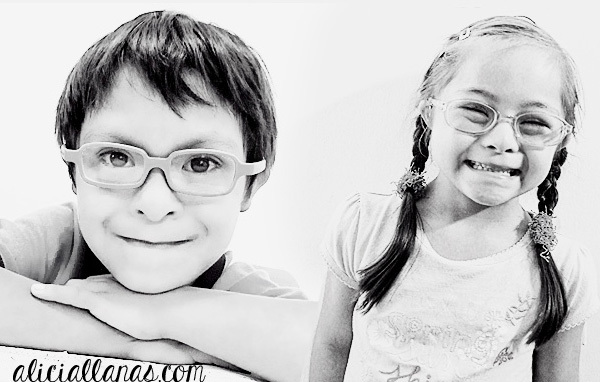 I really enjoy hearing all of the stories of people who don’t have a child with Down syndrome taking the time to learn read blogs!!! That’s great! Also we do plan on keeping it going, my wife and I stay pretty busy with life, and it takes a lot of work to keep it going, but all of the stories we hear from around the world really encourage us to keep it going! Enjoyed reading all your info. By the way, I just checked out your website and how cool that you have a goat farm!! That is neat! Little Man (almost 3, not DS) and I love watching Noah videos. We wandered in from the San Francisco Bay Area by way of southern Wisconsin (we moved last summer). Also we are big fans of San Francisco and can’t wait to bring Noah out there! What do you guys do out there? If you don’t mind me asking what is an “E.C. E.?” I’ve never heard that term before! Rejoicing at all the good news! I am a mother of 3 and we live in Crab Orchard, KY (pop approx 842 in 2000) – or, if you prefer, we are in the “DogWalk” suburb of Crab Orchard, 5 miles outside the town limits and with several hundred fewer people. What a l’il charmer Noah is! That’s awesome!! Thanks for saying hello! You have to tell me how you guys got the name the”Dog Walk” Suburb though?!?!? Also do you remember how you found our blog / Facebook page? I always enjoy hearing stories! I have a beautiful god-daughter with down’s syndrome. I am also a teacher and proud supporter of students with special needs. I live in central Wisconsin. I love following your posts because I learn so much that helps me be a better teacher and person. Thank you! Thanks for the kind words Becky, and thank you for all you do! Teachers are heroes in my book for sure! What age group do you teach? Our Great Grandson Kai who is 19 months old has Down Syndrome. My daughter told me about your site and I have learnt a lot by reading what you write about Noah. I love watching the videos and look forward to seeing many more. We are in Brighton, United Kingdom. Based on the data I posted above there seems to be a lot of families with Down Syndrome located in the UK! That’s awesome! Does your little one have any brothers or sisters! I was told that my last two children would both have DS but neither one did. I feel that I would have been blessed either way. I stumbled upon your website yesterday afternoon. I just moved my family from Colorado Springs, Colorado to Prescott, Arizona. 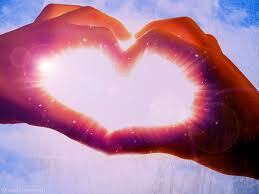 We’re all sending our love to all the little angels out there with DS! Thanks for your comment. Did you do some sort of Prenatal testing other than a sonogram? This is amazing!!! GREAT for you all Rick! I love reading your posts and the pictures. You have an incredibly lucky son, with two so very loving parents. My devout Catholic Grandmother always said my cousin Frances was the only grandchild she didn’t have to worry about because Jesus was looking out for her. Thanks for the kind words Judy! We have a lot of fun over here, that’s for sure! Do you remember how you found our Facebook page by the way? Hi to handsome Noah and his wonderful family from Louisville, KY! As of today I am a fan. My name is April, Apewoof to my cousin Charley. Charlie has been in my life and my family’s life for 23 years now and it just wouldn’t be the same without him. My aunt learned she could not have kids some 20 years ago and her and her husband decided to make the best decision of their lives. They adopted Charley! He was just a newborn when they adopted him.. My grandparents weren’t to sure about the decision at the time but once they actually got to meet him he was a part of our family from that point on. You see, Charley is special just like Little Noah. And by special I mean, someone who sees this world in a special light, someone who has the innocence of a child, who can teach you many things if you just listen and try to understand. Life would not be the same without my cousin. God bless you and your family Rick! And thank you for everything you do! Awareness on Down syndrome is rare but hopefully together we can tell the world about our “special” angels. God bless! 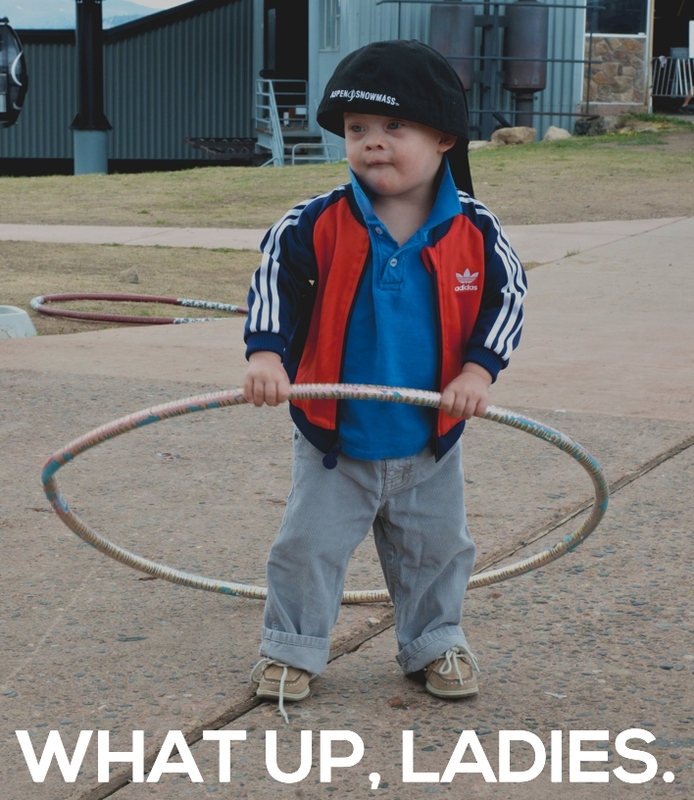 Almost forgot…check out…Life with Charley-and Down Syndrome on Facebook. My aunt started the page just recently. Hope you enjoy the stories on there. She’s a great writer. Thanks again! April, that’s awesome that your family adopted a child with Down syndrome! How did you wen up finding our blog / Facebook page? Thanks Rick! I definitely will. My aunt actually shared this blog on Facebook. So glad she did too. Which I will also be doing. Hi. I’m one of the few Danes who reads your blog. Must say I love it, and I have been deeply touched by it. Down’s Syndrome is close to being extinct here in Denmark, which terrifies me. I learned about Noah and your family last year, as I worked in a L’Arche community in Canada. God bless you and the fabulous work you are doing! We’re in Nashville, TN and I found your page pretty early on, I believe, so I’ve loved watching Noah grow up and seeing the impact you guys are having on the world. Our 6-year old son Case doesn’t have DS but has a rare disease that causes physical/cognitive/behavioral symptoms. He has brought such joy and blessing to our lives and to others so I love seeing Noah do that on such a grand scale! I am in Chicopee, Massachusetts. I have several friends who have children with Down’s Syndrome. I feel blessed to have them in my life. Thanks for your comment, you sound like a great friend! I’m from Malaysia. I started to join your blog and Facebook since 2011 when my friend recommended your blog to me. She lives in Dublin, Ireland. Your blog and Facebook has helped me deal with a lot of issues that my son and I faced. It is good to stay connected with a lot of people from different regions and share their experiences. Thank you very much! May God bless you and your family. I am from just outside Vancouver, British Columbia, Canada. I found a link to your site on another blog I read (Autism daddy). I have a son who has autism. He is 3 years old and is a blessing in our lives. We have another son who was born this past January and he is now 8 months old. When I was pregnant with him we got a test result that said that there was a 1 in 50 chance that he would have down syndrome. The doctor scheduled me for an amniocentesis but I cancelled the appointment because the procedure itself has a 1 in 200 chance that you would lose the baby. We would not put the baby at risk when we would continue with the pregnancy no matter the result. We would find out when he was born. Turns out he didn’t have down syndrome. We also have 2 older girls aged 17 and 8 . They are a great help as raising a special needs son is difficult with all of his therapy appointments and the worry about what his future will be like. These types of blogs like yours that raise awareness about special needs kids give me hope about his future. Thanks for sharing! Hi there! I’m from San Juan, Argentina. I found your page about 1 year ago and I have to say that I love it, you’re awsome! I read every post, watch every video about little Noah, he’s a gorgeous kid. Since Cami is my only child, you helped me a lot, cause I had doubts about Down Syndrome and about how to raise a child. You were (and still are) a big support to me, so all I can say is “thank you”. I leave a pic of Cami in the kinder, costumed like a rumba dancer. Your son is sooo adorable!!! 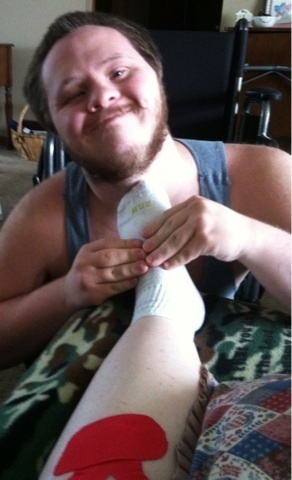 I’m a care-giver for my huband’s brother, Dustin, who is 20 years old with Down Syndrome. Not being able to know Dustin as a toddler, I love seeing all of Noah’s pictures and videos:) He reminds me so much of Dustin. I recently liked your Facebook page, and the video of Noah in the crib is hilarious, and reminds me so much of Dustin, right down to the “that’s not funny”. I really appreciate you sharing Noah’s life with others , it really helps me not feel so alone as a care -giver . It’s always a pleasure to see Noah’s pics n videos n even just visiting your page to know what Noah is upto now…such an angel he is….I’m from Lahore Pakistan n I’m your regular reader n I think since 2011. My baby Miral is 3.5 yrs old n also an angel in our lives. Thank u for being in our lives so positively. Love to Noah. Hi im from london england 🙂 I have a 14 month old son called zakk who has ds, he is my youngest of 7 children…. I can honestly say hand on heart that your page and most importantly noah has given me so much hope and inspiration for the future. Having someone who shares advice thats been tried and tested is so helpful. I live in Swansea, Illinois. I work as an aide with special needs and I started doing this when my family was stationed in Germany. My kids were in school and decided to go back to work and was hired to work as an aide in the special ed department there. Once we came back to the states, I found work in the school district my daughter was attending and became an aide for special needs again. I have worked with three wonderful kids who was born with downe syndrome and now a boy born with spina bifida. I love to watch the kids grow and succeed at their goals on their IEPs. I always enjoy seeing your Facebook posts and that sweet little face of Noah’s. Thank you for what you do to show that ALL LIFE is precious and worthy of respect and love. May the Lord continue blessing your wonderful family. Oh, and I live in Jacksonville, Florida where I am a teacher, wife, and mother to a sweet 7 year old girl who happens to not have Down syndrome. Hi, I am from London, Ontario, Canada and I came across your block on facebook and just fell in love with your son. My two children are in their late 20’s and I don’t know any child that has down syndrome but I enjoy seeing what Noah and your family have been up to. Representing Mpls, MN over here. 🙂 I do not have a ds child (tho I do have a 20 mo. old son), but I have a special love for them in my heart & love to promote their right to LIFE & LOVE of their family. Thanks for all you do for the ds community! I don’t remember how or when I found your page. None of my children or grandchildren have DS, however, I do have a cousin with DS. She is who she is and she gets no “special” treatment from us. We get her into trouble just as much as we do everyone else. We also have a cousin with Cerebral Palsy who is wheel chair bound and has no speech. And again, we just accept her as who she is. In fact I an still banned from taking her for a ride in her wheel chair because we had a race against a motorcycle, granted we lost, however, we had a lot of fun. I have not seen them for a few years because of living in different states, we do keep up thogh by snail mail! i live in the middle of nowhere, in the back of beyond on the prairies of ND. I live outside the small small town of Kief and raised my children on a dairy farm. I get my grandchildren everyother week end and 2-3 weeks during the summer. Love watching Noah grow and learn, and hearing how he is an inspiration for others. In fact I have used some of your tips on toys and other things with my grandchildren just because they sounded like common sense. I enjoy the page and will continue to read and share, and look forward to hearing and reading about your growing family! Hey! I’m from Buenos Aires, Argentina (Quilmes city). My cousin’s daughter was born with down syndrome. I’m not really too close to my cousin but I love this little girl (she’s 2) and your blog helps me understand how is it to raise a child with DS… and thanks to you I can pass on words of comfort to the rest of my family, who sometimes seem pretty worried about Lucy’s development. Feel free to chime in any time! Thanks for the kind words, and thanks for all you do! What sort of teacher are you? Do you work in a public school? Hi, my name is Natalie, I’m 31 and I live in Manchester, UK. My husband and I do not have any children and we don’t really plan on having any. I read your blog because you have such a friendly way of writing, you don’t seem to take anything too seriously and your family comes accross as being happy in the joys of life. This is enlightening and inspirational. I love reading about Noah and his milestones and hope that it has educated me slightly and given me an insight into both his world and yours. Thanks for the kind words and for following along with our story! Rick you have without a doubt Blessed our DS community ! Wish I would have had this resource when Blake was born in 1996. May God contunie to Bless your sweet family !!! Thank you for your good works ! 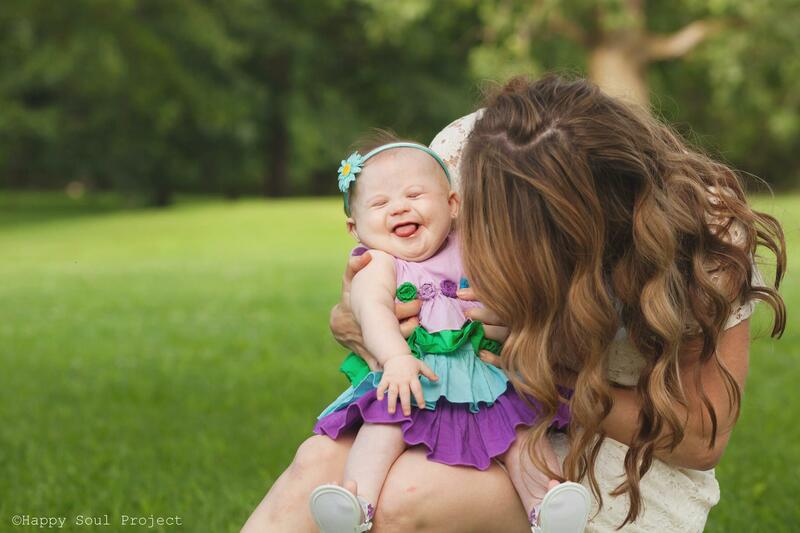 HI You have a little fan club here in our house – St Charles MO (about 20min away from St. Louis MO) Our Daughter Teresa just turned 11 Months yesterday We love reading your Blog!! Noah is such a cutie!! When we found out Teresa had Down syndrome through Amnio we started to Read everything we could in Regards to DS I am so glad for your Blog it was the light we needed to guide us into uncharted territory!! Thanks again to you and your family for the positive impact you have. I live in LaGrange, Georgia and would love to connect with a Down Syndrome child and family here. How do I find one? Noah is precious and I know he IS the light of your life. Hello, We are from Israel. We have a boy with down syndrome. He is one year and three months. We did not see Israel is on the list of countries in this post. Why is that? Hello, we are from Israel and we have a boy with down syndrome who is one year and three months. We did not see Israel in the list of countries mentioned in the list in this post. Why?